The practical exam has been over. Yeah! I have done a quite good job in "TIK". I've finished all the tasks given. Even I finished it badly in Macromedia Flash part. I was doing good in Ms Word, Excel and HTML. Thank God! I'm quite lucky today. I finished it QUITE well. haha. And the last one is English. The listening part is easy, but still, I got only one mistake! I regretted it, why I chose answer C. It suppose to be D. T.T But in speaking part, I think I can covered my bad in listening, because I'm doing good in telling a story, even some odd-guys were hanging around me and made some dorky expression to lost my concentration. Anyway, I dunno what should I write.. I'm thinking hard, seeing many tuts on my keyboard. Today, I watched "World Trade Center" in Cinemax, starring by Nicolas Cage. (John McLoughlin). This movie is based on the true story from William & Allison Jimeno. William is an officer from New York Port Authority Police who saved from the attack on WTC that day (Sep11, 2001). Two thumbs up for the movie! As you know, people in New York, saw "evil" on that day. Two planes which was hijacked by the terrorist crashed the twin towers. With this movie, I realized that Nicolas Cage's acting was so awesome and amazing! He's my idol now, after Will Smith^^. Maybe, after the exam has been over, I'll ask my daddy to watch Nicolas Cage's newest movie : "Knowing" in the cinema. My friend said that "Knowing" is a really worth watch movie. 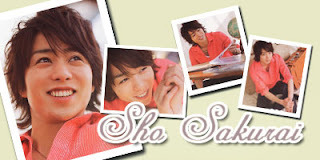 I also visited arashindo.com and found a NEWEST-SUPER-CUTE-PIC of Sakurai Sho!!! * His expression is really natural. If he likes it, or something is going funny, he will laugh hardly. *I love his laughter, anyway* If he doesn't like it or feel scary about something, he will tell it towards honestly. * Haha. He has the best body of all. That's all. Even he's not the tallest one in the group. * Sho's perfectionist. He will try the best to do something. He want to be the perfect one. Nevermind, if we call him "Mr. Perfect." He's the only Mr. Perfect and an ideal guy for every woman, including ME! 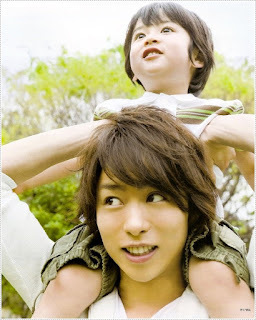 * As you know, Arashi's leader is Ohno Satoshi. We known him as Riida (Riida means Leader). But, Ohno is a leader who always do nothing as a leader. He act doesn't like a leader. For me, the real leader is referred to Sho. Despite not being the leader, everyone knows he's the one with the leader-ish qualities. So, even Ohno won the janken-poi to be a leader, the real leader should be Sho! * I was inspired by his quote : "We want to be a group which can make one proud to say that they are Arashi fans." Isn't great, buddies? I've never found a group which has a really strong bond like Arashi. This September, Arashi will celebrate their 10th Anniversary. I will still idolise Sakurai Sho. He has been inspired me that school is the first priority. "Arashi, as you may have realized already, is a group of five people. Five different people with different personalities, but that's what makes them special. Aiba's always saying, "If Arashi hadn't been formed, we definitely would've never become friends." The special part about Arashi is how they're so different (they're sparkled into many characters : cool, funny, baka, stylish, pranks, etc.) but so close." I'm really sorry, but I'm really "in" to Sakurai Sho! It's time for me to sleep.